Hi, may I know if there is a channel for Watir? anyone using Selenium IDE to test extjs web application? Hi anyone using selenide ? I run this command `System.out.println(driver.getCurrentUrl());` in Eclipse on my app which gives correct result but running the same command in Intellij does not give the complete url any ideas ? I run this command `System.out.println(driver.getCurrentUrl())` with `ChromeDriver(options)`to get complete url path for app but with `FirefoxDriver(options)` I do not get full url path. JayBee-sl: what do you mean? Hi . . Is it possible to configure selenium C# code with Azure server with Frontend/Backend code of my app. And when admin try to deploy a new build then my script should run also and figure out issue if there is any issue in new built? Hi All. Can you suggest the best book to learn Selenium using Java? Can you suggest a good book to learn Selenium using Java? any suggestions in this instance? @simonstewart - send method in devTools does not return the expected value from the chrome devtools protocol. Am I missing something? Does anyone know wy i get SeleniumException: Unknown command: storeGlobal? hi, how can I get the browser locale (in java)? it seems not to be working anymore with 3.141.0. how do I set the chrome browser locale correctly? I'd do the usual debugging steps, check it on a different version of chrome and also a different version of selenium. The chrome switches are by and large not controlled by the selenium devs. I use the corresponding selenium docker image version 3.141.0, like I did for 3.14.0 where `options.addArguments("--lang=de-DE")` worked, are there any alternatives for setting the locale? Hello, I'm here to discuss about a something I don't understand about selenium. 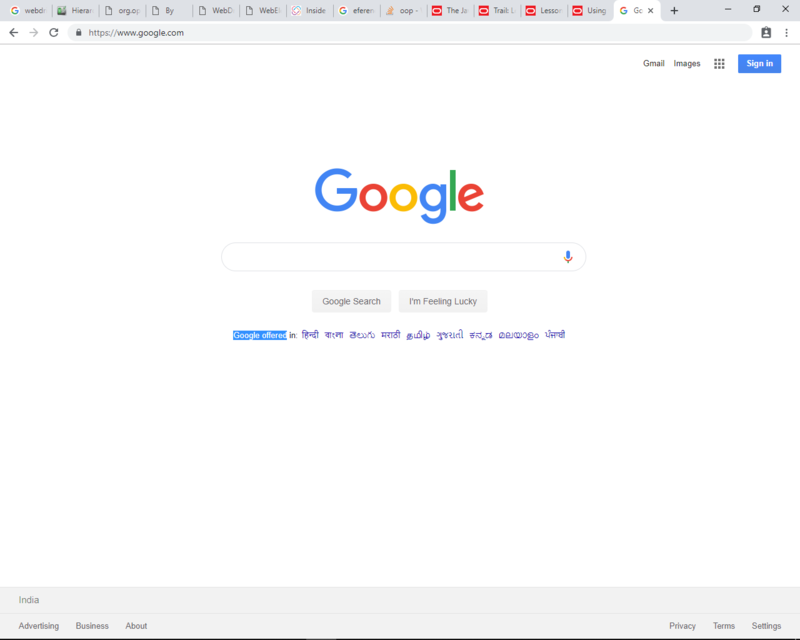 What has been happening to the results of my code is when I call .back() to move my web browser back and make another search, it makes the same search previously even though it keys in different words to search. I was wondering if anyone here knows what is going on? I've checked my variables to see if I'm storing the information making it loop the previous data, but didn't see anything like this. are you able to create a :sscce ? if so, it allows someone else to triage your code. it's gonna be hard to convince the lifers that abstraction for fun isn't helpful. humanBird: I can't even imagine what you just conveyed to me lol. and put callSomeFunctionThatDoesAllTheSteps() in another file. this function is used exactly once in the entirety of the code base. in that one test. I wouldn't know about the expansion of it into the corporate world or dealing with extremely large code bases where half the code serves no functional purpose. Maybe one day I'll be so unhealthy that I'll be forced to leave my haven and obtain a job that provides health insurance so that I can afford to pay thousands of dollars for services that should be considered basic services at this point. Anyone got any experience automatin against Kendo Grids? Specifically, I have a grid with a table cell in it that has both an input element as well as a drop down element and a searching element, something like td/kendo-combobox/span/kendo-searchbar/input. On the UI, the table cell itself has the word 'Air Conditioner' but in the DOM I can't find those words anywhere. Hello, has anybody used Selenium with Vysor to record tests? Place seems pretty quiet. Guess most folks are at SeConf, or en route. i wish i was in Japan right now. i want to find out the what japan is doing with female robot automation. just for research/asking for a friend purposes. :not-visible or something like that. Maybe. hrm. here's my problem. i have a login widget on the page. lets say i'm on the login page. then i can also click another login link which will pop up a login modal. there are now two login widgets on the page. the one behind the modal and the one in front of it. implementing two classes just for different selectors is gonna be ridiculous. maybe a ternary will be better here. adding abstraction such as ModalLoginComponent or what not as a class seems like overengineering for two different kinds of modals. this is a direct result of not having reusable code. can we watch selenium conference from youtube channel for this week in Japan? It took months for the Se Conference videos to get posted after Chicago. Does anyone have any ideas of how to debug a ElementNotInteractable exception on headless IEDriver? It's running on a teamcity server so there is no visible display. It's so interesting because if I do a click on the element it passes, but it's the SendKeys that doens't work.